The year 2019 marks the 100th anniversary of the March 1 Movement. As is customary, many people celebrated the March 1st Independence Movement with writing down the names of independence fighters on objects, as well as other related events. Among these activities, a movie about Yu Gwan Soon was released, stirring the hearts and arousing patriotism in many Koreans. Yu Gwan soon is known for distributing national flags to a crowd in Ahwoonae Marketplace during the independence movement from the Japanese occupation and was subsequently arrested. She was sentenced to three years in prison and died of a bladder rupture caused by torture during her sentence in the Seodaemun Prison. Director Cho Min-ho visited the Seodaemun Prison one day and the sight of Yu Gwan-soon's picture made his feel intense sorrow. 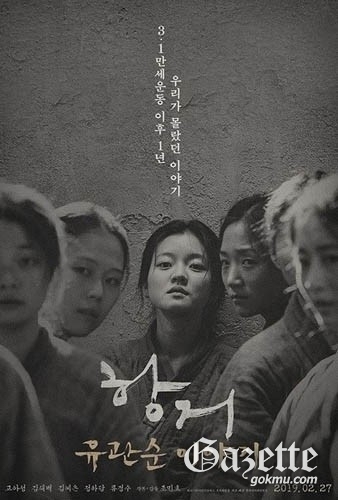 Later, Cho visited Room 8 at the History of Korean Women inside the prison and recalled the stories of Yu Gwan-soon and the women who risked their lives in the midst of the bad conditions. In particular, directors and producers wanted to capture Yu's life amid the torture and persecution at the age of 17, and tried to represent Yu on the screen honestly through accurate historical facts. It also tells the story of Yu Gwan-soon and the 8th woman who have been taken to Seodaemun Prison for Independence Movement.